Bryan Cranston has indicated not only will it be difficult for him to appear in the upcoming “Breaking Bad” sequel film due to the events of the series, but he tells Today he’s committed to the Broadway production of “Network” until March. MGM has acquired the rights to develop the feature musical “Hope” with three-time Grammy Award winner Chance the Rapper and longtime manager Pat Corcoran. Carlito Rodriguez (“Empire,” “The Leftovers”) will pen the script. Clifton Collins Jr. and Izabela Vidovic are set for recurring roles in Hulu’s eight-episode revival of “Veronica Mars” which is set to premiere in 2019. Collins will play Alonzo, a mid-level hitman for a Mexican cartel. Vidovic will portray Matty Ross, a woman not content to wait for justice. 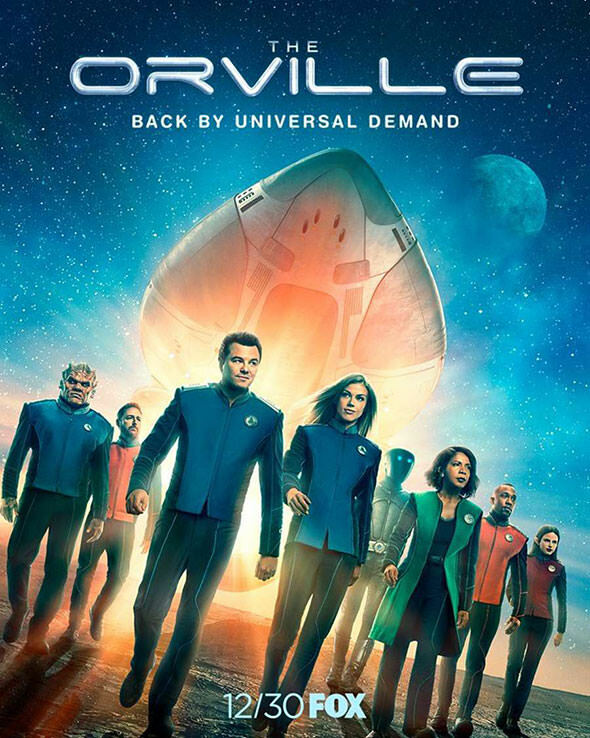 FOX has premiered the official poster for the second season of its sci-fi dramedy “The Orville” which is scheduled to premiere on Sunday, December 30th with new episodes then resuming on Thursday nights. In season two, Ed and Kelly’s relationship will take a new turn, while the ship’s crew will meet never-before-seen aliens, face old adversaries the Krill, make first contact with a new civilization and revisit the planet Moclus. Seth MacFarlane, Adrianne Palicki, Penny Johnson and more return while Robert Picardo and Marina Sirtis will guest star.